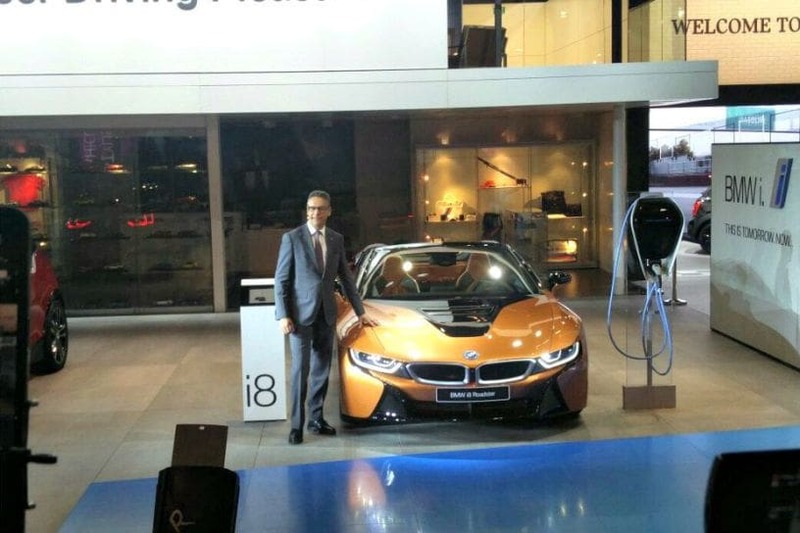 BMW showcased the i8 Roadster hybrid sportscar along with various other cars at the ongoing Auto Expo 2018 today. The i8 Roadster will be launched in the country this year. Like the i8 Coupe, the Roadster too is based on BMW’s LifeDrive Vehicle architecture. It is, however, 60kg heavier than the hard-top version thanks to the addition of body-strengthening elements. The design is quite similar to the coupe with elements such as the air shutter on the bonnet being carried over. It gets 20-inch alloy wheels and ‘Roadster’ badging on the C-pillar. The soft-top roof can be stowed away in 15 seconds by the push of a button, while space-age cockpit from the coupe has been retained. The i8 Roadster is powered by a petrol-electric setup. However, it gets a more powerful electric motor which produces 143PS of power (instead of 131PS on the coupe) and 253Nm of torque, and is powered by a 34Ah battery. The 1.5-litre petrol engine remains the same as before and produces 231PS of power and 321Nm of torque. BMW claims the i8 Roadster can do 0-100kmph in 4.6 seconds and has a top speed of 248kph.